Utah; Utah State Guide; American Guide Series; New Deal; Works Progress Administration; WPA; Federal Writers’ Project; FWP; Federal Project One; Tourism; Great Depression; Ogden; Ogden Canyon. This is an image of Ogden Canyon from “Utah: A Guide to the State”, the Utah State guidebook from the American Guide Series created by the Utah Federal Writers’ Project during the New Deal. Utah State University, Merrill-Cazier Library, Special Collections & Archives, Book Collection 39 no. 44. Page 444. The photographs on these two pages were made by William H. Jackson, official photographer for the Hayden Survey of the Territories in the 1870's. 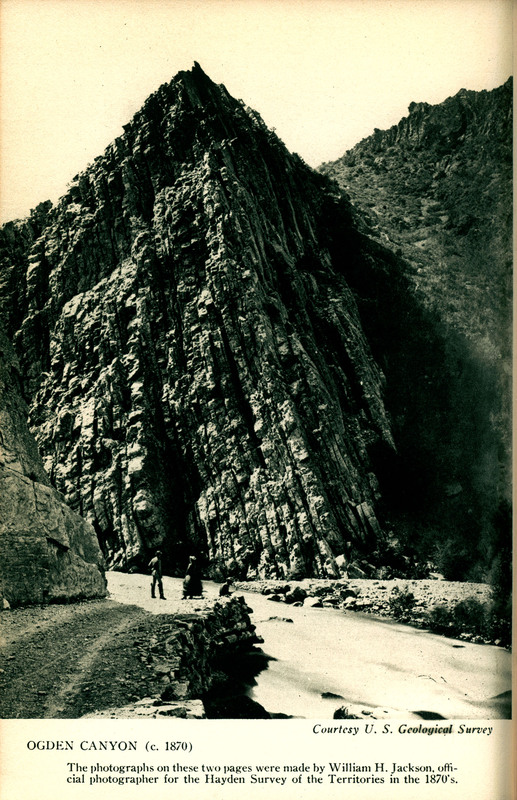 The Utah Federal Writers’ Project, “Utah State Guide Image of Ogden Canyon,” USU Digital Exhibits, accessed April 21, 2019, http://exhibits.usu.edu/items/show/18789.